You know you’ve got a fabulous recipe when your 14-year old son takes a bite of a fresh Chocolate Zucchini Muffin and says, “Hmm. Great texture.” Or maybe I’ve just got a fabulous 14-year old son. This is a given. 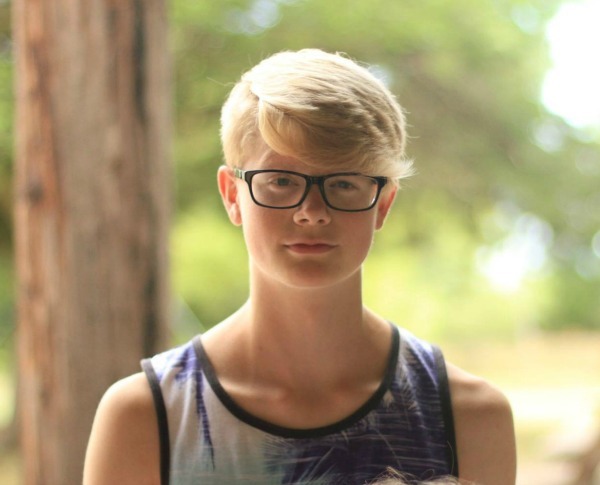 Here’s a pic of this amazing kid at church camp this summer. Yes, the girls have noticed him. Every single girl has noticed. Let’s go back to talking about the muffins. These muffins are “moist like a cupcake.” Again – the description of my 14-year old. The original recipe I had for these muffins called for one full cup of sugar and (brace yourself) an entire bag of chocolate chips. An entire bag. Not only am I not interested in adding that amount of sugar to the healthy and necessary meal I like to call “breakfast” – I’m also way too cheap. Would you like a little muffin with those chocolate chips? With proportions like that, you might think that cutting the sugar so drastically as I did might turn out a boring and inedible muffin. But allow me to remind you of the teenager’s comment from above, that these muffins are “like a cupcake.” This from someone who would never have argued with me if I had chosen to dump an entire bag of chocolate chips into my muffin mix. He didn’t even know what he was missing. He also didn’t know he was eating zucchini. When writing this recipe for you, I shared a range of measurements for the sugary ingredients. Your family might prefer these muffins to be a bit sweeter, in which case you’ll want to go with the 1/2 cup portion of sugar and chocolate chips. Either way, the muffins will turn out amazing. You know – moist like a cupcake. Mix together flour, sugar, cocoa, baking powder, and salt. Stir in shredded zucchini, eggs, and oil until well combined. Scoop into 12 prepared muffin tins. Enjoy these muffins for a Back-to-School breakfast or as an after school snack. Need more breakfast ideas? Find 60 Make Ahead Breakfast ideas in this post. Here’s your final reminder to sign up to win a copy of our new Low Sugar Treats eBook!! This recipe looks and sounds great. I try to cut down on sugar intake, but still want a “healthy” treat. You list coconut oil as an ingredient. I use the “smelly” kind and the “non-smelly” kind. The virgin coconut oil, AKA the smelly kind does give a sweet taste so I can cut down the sugar amount. I was wondering what kind of coconut oil do you use, or did you use in this recipe? Not the brand, just the kind. Thanks. Great timing. I will be making this today depending on the humidity. When you say shredded zucchini, you do mean the green skin/peel of the zucchini as well as the white inner “meat”? I’ve rarely used this vegetable in any cooking so wasn’t sure. I always grate the whole zucchini when I use it for bread or muffins. I don’t peel it – I grate it skin and all! I think the little green flecks (of skin), are one of the nice things about baking with zucchini, plus veggie skins usually contain a lot of the nutrients, so I’m with Charlotte and Laura……skin ON! Butter should work just fine! My bro (who is also 14) loves chocolate zucchini bread, so this is on my to make list. Btw, that is a “fabulous” picture of Elias! Have a question tho, is this chocolate caffeine free ? I checked it on Amazon and even chatted with someone and they could not tell me if it was caffeine free or not…….that should be listed on the pkg. Absolutely PERFECT timing on this wonderful muffin recipe. We get a farm share, and this summer I actually work on that farm, so we are inundated with zucchini!!! My sons don’t love it on it’s own, but really like it baked into almost anything. And with chocolate…..it doesn’t get any better than this! I have lots to use (while the rest will have to be grated and frozen for later), so I’m really looking forward to making these this week. Thanks for another great (get it? “grated zucchini? ), recipe! This was timely! 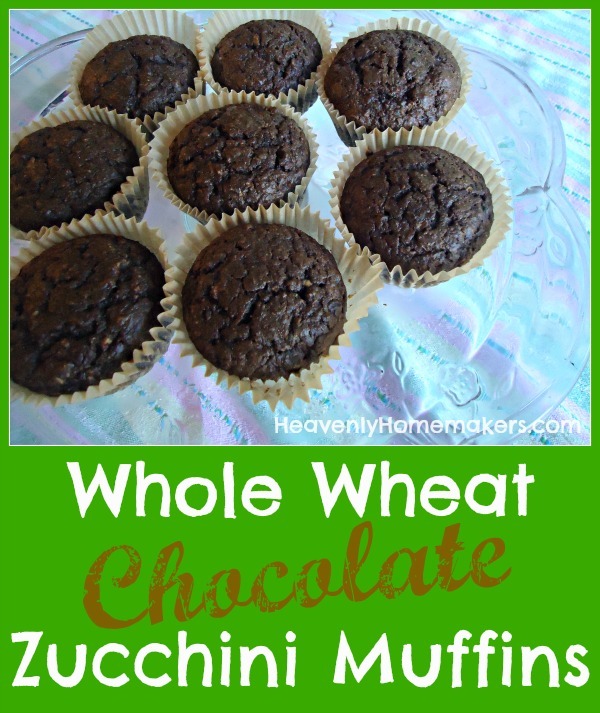 I had just decided to make Zucchini muffins and this was in my newsfeed! I baked these today – the only addition I made was a handful or two of pumpkin seeds. They are so moist and the perfect sweetness. My little kiddos gobbled them up. I was lazy and used my Blendtec to “grate” my zucchini! I just made these and we all LOVE them! 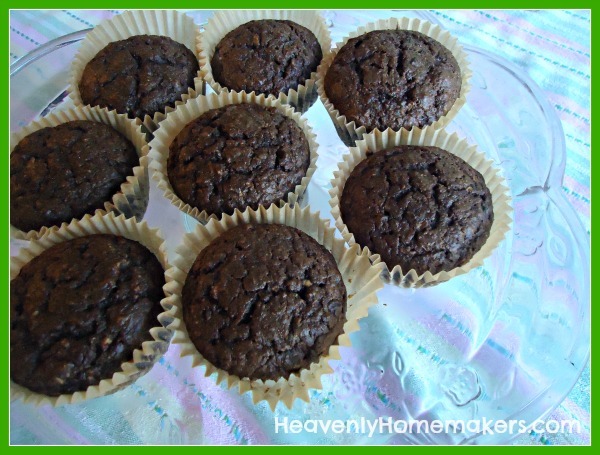 And believe it or not – I did not have any zucchini on me when I got the urge – so, I substituted pumpkin instead and they came out fantastic; very fudgy and chocolaty, but not overly sweet. Just thought you’d like to know since pumpkin season is next up.. Thank you! Yikes, I really don’t know since I don’t have much experience with GF flour blends, and I really am inexperienced with subbing eggs. Whatever you typically use to replace whole wheat should work okay, I think. Let us know what you decide and how they turn out! Hi. I made these today. I used the virgin coconut oit, cause it know that helps to add sweetness. I used the smaller amount of brown sugar. They were sweet enough for me, but my husband would’ve preferred a little more sweetness. My problem was they were dry. I mill my own flour. Typically 1 cup of the whole wheat berries equals 1 1/2 cups flour. I don’t measure the flour. But I’m wondering if I should from now on as they were dry tasting. And you could see the shredded zuchinni. I have a WonderMill. Anyone else experience this problem? Thanks. I used the old manual type grater. Next time I’ll use my magic bullet or ninja and see how that works. Thanks! They do taste good. And I love how you’re posting low sugar recipes! I found the batter extremely dry. I grated the zucchini with a grater also, and I squeezed out about a teaspoon of liquid. The batter was so dry I couldn’t even incorporate all the flour. I ended up adding about a cup of milk, just so i could bake them. I thought I had missed an ingredient or something. I had the same issue, the batter was incredibly dry. How did they turn out with the addition of milk?